Do you know the origin story of coffee? Where did it come from? How did it get to Europe, or the Americas, or the Far East? What part does coffee play as an intersection of Muslim, Jewish, and Christian faiths? How was coffee involved in revolutionary events around the world? What can coffee do for the world today? How can you make a barista smile? These and many other questions are not simply answered, but they are woven into Tim Schenck’s book, Holy Grounds. Explained with wit, compassion, a trace of sarcasm, and a splash of humility, Mr. Schenck provides not just details, but fascinating facts about this common, but not so common, daily ritual…the cup of coffee. Do you know what’s in your cup? 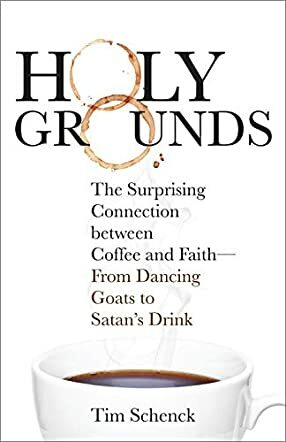 Holy Grounds by Tim Schenck is a fascinating book which belongs on the coffee table of anyone who considers himself or herself a coffee connoisseur. I loved the history involved in it and the personal stories that are woven throughout! I couldn’t believe the controversy that has surrounded this everyday morning-starter. Mr. Schenck tells the narrative with the passion of a zealot, but also with the humor of a realist. I think it was the intriguing details that got me the most—these were the ones that I had to stop and tell my husband about over and over again. Yes, I looked up the Coffee Grinder Carbine! And, yes, I downloaded the Coffitivity app! I’ll never look at my daily Cup of Joe the same again!